Bringing in wood helps warm a space, something that’s especially welcome in stark white kitchens with steely appliances. But when applied to flat surfaces like cabinets, countertops and floors, wood tends to recede into two dimensions. To capture the warmth and still bring in some 3-D heft and texture, consider rustic wood beams and posts. Here, four kitchens show the breadth — and appeal — of the material. Homeowners’ request: Update a cramped, dark kitchen by removing an overpowering brick wall to open the space to an adjoining family room. 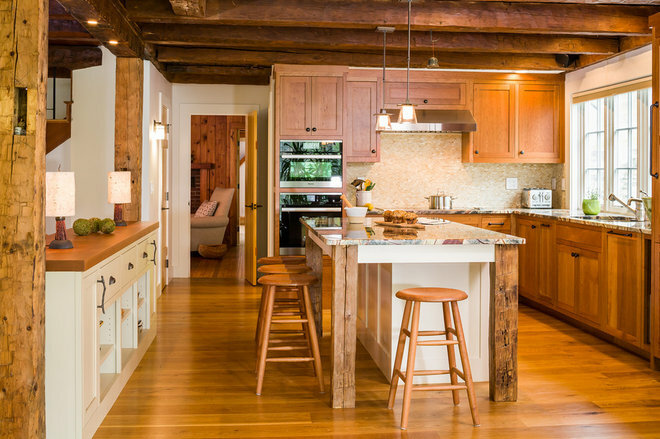 Wood beams: Reclaimed from an old farmhouse. 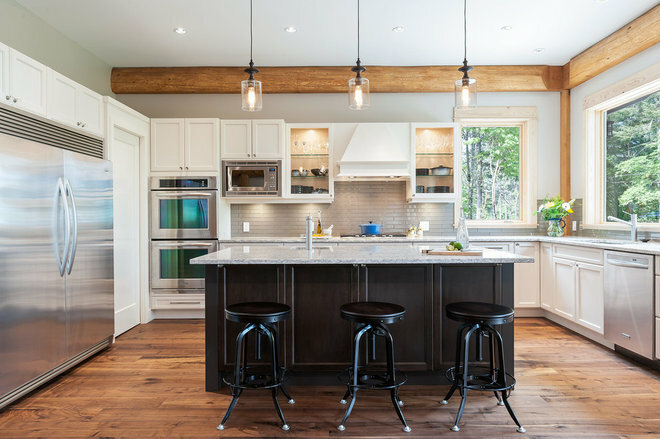 “We installed small LED lights in one of the beams and pendant lighting in another to help with fast lighting,” designer Cheryl Boghosian says. She added new beams for the legs on the island. Other special features: Custom cherrywood cabinets. Rainforest stone slab countertops with eye-opening color and movement. Hickory wood floors. Oil-rubbed bronze lighting and hardware. Separate faucet at the sink that serves well water from the site. Designer secret: “Using so much natural stone and wood in this space, I made sure the lighting was appropriately placed to highlight textures,” Boghosian says. Homeowners’ request: A warm, open, inviting central hub with double-hung windows to highlight lake views. Wood beams: Raw reclaimed-wood timbers. 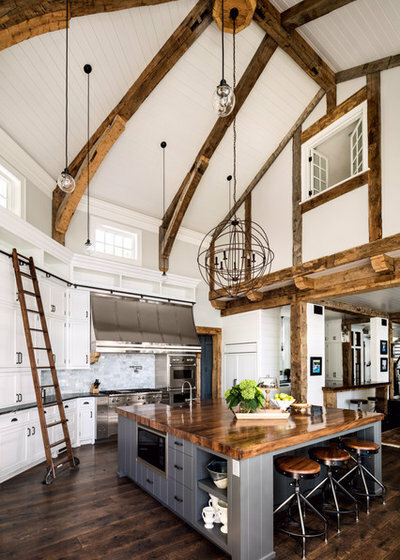 Darrah Barns found, cleaned, treated, shaped and installed the beams, which echo post-and-beam architecture found in the surrounding area. 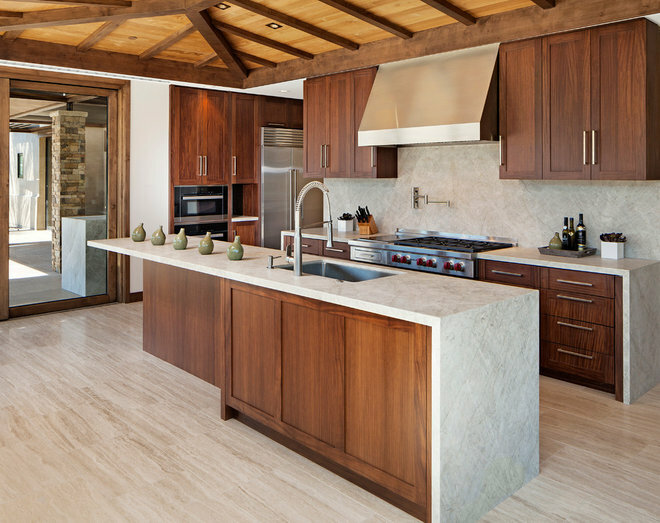 Other special features: Wood countertop helps tie the island together with the ceiling. Custom cabinets. Stone backsplash and counters. Stainless steel range hood. Second-floor casement window looking out from the laundry room. Homeowners’ request: A large kitchen with two full-size sinks, two dishwashers, a baking prep area, a dining nook to seat six and an island that could seat four. They also wanted contemporary Pan-Asian style with a warm, casual feel and simple, durable, easy-to-clean materials. Wood beams: Alder wood box beams cross the ceiling. Clear-finished reclaimed-teak flooring material clads the space between the beams. Other special features: Solid quartzite slab countertops and backsplash minimize grout joints. Sixteen-by-24-inch vein-cut travertine stone tiles cover the floor. Custom cabinets made from Afromosia wood. Baseboard “crumb catcher” vacuums. Mountain views. Designer secret: “Totally retractable, yet not fully opaque, automatic window shades were installed to cut the harsh afternoon sunlight, while allowing the viewer to see the outside,” designer Chris Moore says. Wood beams: Western redcedar logs. The post-and-beam structure of the home forms the backbone and uses full logs as a structural support to provide a natural log surface inside and outside the home. Other special features: Corner cabinet recycling station. Toe-kick vacuum on the island. Designer secrets: “The choice to make the island a darker color really made it stand out,” designer Kevin Simoes says.